Finding Love Could SET ME FREE–Excerpt and Giveaway! 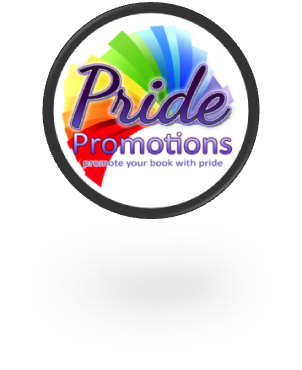 Be sure to drop below and enter the giveaway for a $25 GC or one of FIVE ebooks of SET ME FREE. When an affluent college-bound boy falls for a young artist, he must choose between the life that’s been mapped out for him and the chance at true love. They found a secluded spot to sit off the main drag and scarfed down pieces of pizza and people-watched. Aaron had been full of nerves earlier, but Lucky put him at ease. He had that way about him. “I’ve got a few minutes left,” Lucky said when they finished their food. They got up, sipping at their drinks as they made their way through the crowd back toward Lucky’s booth. It was now or never. He had to ask, had to get the words out, or miss his shot. “Sure,” Aaron replied, his heart beating a little faster. He had no idea what was coming now; what could Lucky possibly want from him? A kiss? Aaron blinked at him. Lucky tilted his head off to one side and Aaron turned his head the same direction. His gaze landed on a photo booth, realization sinking in. His mouth fell open, unsure what to say. It was a little weird because they barely knew each other, but also flattering. Aaron couldn’t help the chuckle that escaped at Lucky’s words, even as the idea of Lucky drawing him again and again left him breathless. “Um,” he managed to get out, glancing around at the crowd. A familiar blonde head caught his eye and he nearly choked. Was Lyn at the carnival? Wasn’t she supposed to be with their mothers? Aaron pulled Lucky by the hand into the photo booth and slid the curtain shut. Lucky slid money into the slot as they sat down. His breath caught as Lucky’s hands touched his face gently. “Like this,” Lucky whispered, turning his head to the side. The camera flashed. Lucky’s fingers turned his head to the front, pulling away just in time for the camera to go off again. Once again, Lucky’s fingers turned his head to the side, only now he was facing Lucky, staring deeply into his eyes. Aaron tried not to hyperventilate as he held Lucky’s gaze. The camera flashed for the last time but neither of them moved. “Go out with me?” Aaron suddenly blurted out. He had to do something or he might do something even more insane, like kiss Lucky. Aaron so wasn’t ready for that yet. Lucky’s eyes widened and he smiled. My name Kitty Stephens. I currently reside in Ohio, with my husband, my son, and our three guinea pigs. I’ve been an avid reader since I was very young and started writing when I was around nine or ten. Once I had internet access, I became active in fan communities and started posting my work on various fan sites. Set Me Free is my first book. What’s the easiest thing about writing? Creating an outline/planning out the story. The planning stages are always the easiest. Name one author (living or dead) you’d like to write with? Wow, maybe Chris Colfer? He’s one of my favorite actors/authors and his books are great. I think we could write something amazing. Tell us about your cover and how it came about. 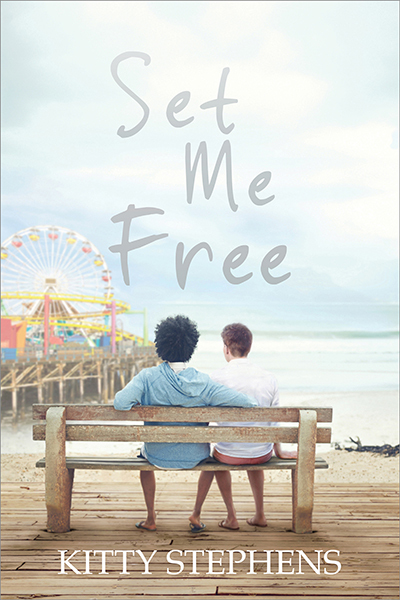 The cover of Set Me Free is of Aaron and Lucky sitting on a bench on the beach, looking out on the carnival and the ocean. We knew when we talked about the cover we wanted to involve the carnival, since it’s at the forefront of the story. We also wanted to include the ocean and the bench from the pier. The back cover also includes some art supplies, a reference to Lucky’s artwork. Is this book part of a series? Do you have ideas that could make it into a series? If it is a series, tell us a little about it. It is not! I considered trying to develop it that way very early on in the writing process, but I passed that idea over almost immediately. This story works better as a standalone novel. Interested? You can find SET ME FREE on Goodreads, Interlude Press, Amazon, Barnes & Noble, iTunes, Smashwords, IndieBound, and AllRomance. Click on this Rafflecopter giveaway link for your chance to win a $25 Interlude Press Gift Card or one of FIVE E-copies of ‘Set Me Free’ by Kitty Stephens! Kitty Stephens’ writing aspirations date back to her childhood, when she and her brother would make up stories about characters in their favorite books. She eventually started writing stories in online fan communities, and majored in English at Ohio State University. She lives in Ohio with her husband and son. Set Me Free is her first novel. You can catch up with Kitty on her Tumblr Facebook, and Twitter. Thank you so much for hosting me today! I’ll be checking back later to answer questions. Sounds great! Thanks for popping in!